The end of the gardening season doesn’t have to mean the end of fresh herbs. Most herbs can be grown successfully inside on the windowsill as long as they get enough sun and water, and they will give your dishes the fresh, delicious taste found in gourmet restaurants. In addition, windowsill herb gardens can dress up a winter window. Herb plants can be started from seed, started from cuttings, or moved indoors from outdoors with special care. Herbs can also be bought already potted and established at stores; grocery stores generally sell some year-round in the produce section. Read on to discover some of the best herbs to grow indoors and tips on how to make them thrive. Most herbs need full sun, and all of the ones I list below need at least four hours a day. South-facing windows generally provide the most sun. East- and west-facing windows should provide enough light, but north-facing windows are usually not bright enough. Even in a bright window, the herbs may grow spindly and leggy, but they should still provide plenty of cuttings and flavor for your cooking. During the winter, if your plants are in a windowsill, be sure the leaves aren’t touching the glass or they could die when temperatures drop and the glass gets cold. Use containers with drainage holes with saucers underneath to catch the extra water that will run through. I do not recommend using terra cotta pots, as they dry out very quickly and indoor air is already quite dry in the winter when the heat is being used. If you can mist your herbs with water or run the foliage under the sink now and then, the plant will appreciate it. I recommend starting indoor herbs from seed, taking cuttings from an outdoor plant, or buying an already established pot of herbs from a grocery store or garden center. Bringing a plant that has lived outside in full sun all summer to the dark and dry indoor conditions is a big shock to a plant and could kill it or at least weaken it. If you plan on doing this, slowly adjust the plant to indoor conditions by moving it into a shady area outdoors more and more each day before bringing it in. I also recommend cutting it back. Basil is a useful plant used in many different dishes. It is widely used in Italian foods, and certain varieties, like Thai basil “Siam Queen,” are excellent for Asian cooking. There are many varieties to choose from, and some are quite ornamental. Basil starts easily from seed or from cuttings. 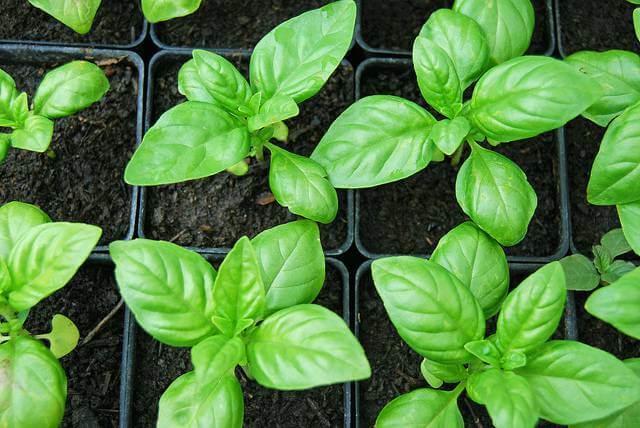 The trickiest part of growing basil indoors is keeping it warm; if you are growing it on a windowsill, the cold night temperatures could damage the plant or even kill it. You will have to remember to move the plant at night or grow it farther away from the window. Basil is a plant that loves warmth and needs it to survive. I love putting whole basil leaves on my pizzas and sprinkling cut-up leaves into my pasta sauces. Mint is a tough little plant that adds a lot of natural flavor to both beverages and food. I love putting fresh mint in both hot tea and iced tea or even plain water. When you think of mint, chances are you think of spearmint or peppermint, but there are a variety of others, like chocolate, apple, pineapple, and even orange. 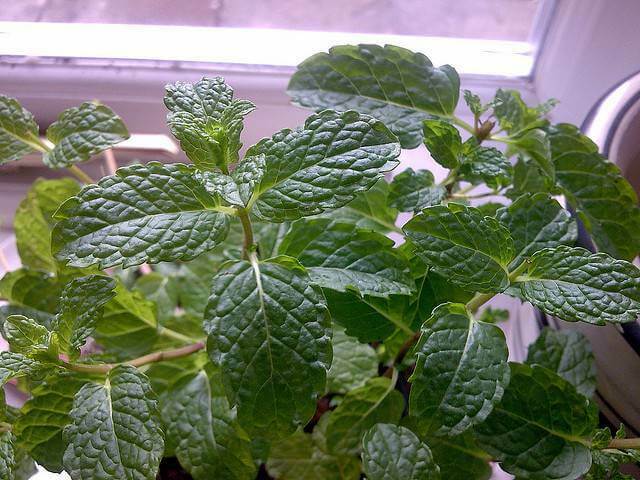 The trick with mint is to keep the soil moist at all times and to keep the air around it humid if possible; setting it on a tray or saucer of pebbles that are always kept damp will keep the air around it moist. Ah, parsley, the herb that is placed on the side of the plate and seldom used. This herb is full of vitamins and taste and should be eaten instead of merely looked at. Chop up parsley and add it to salads and pesto, or use it in a sauce for fish. It really has many uses. 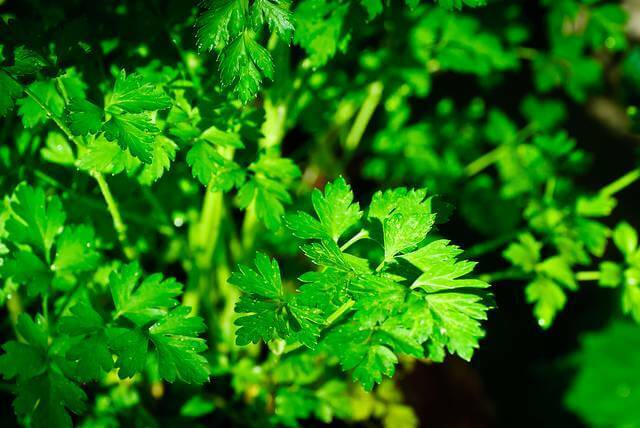 Growing parsley indoors is not difficult, but starting it from seed is. It also can’t be started from cuttings, so your best bet is to buy a pot of it. If you love to make your own salsa, then you already know that fresh cilantro is a must. 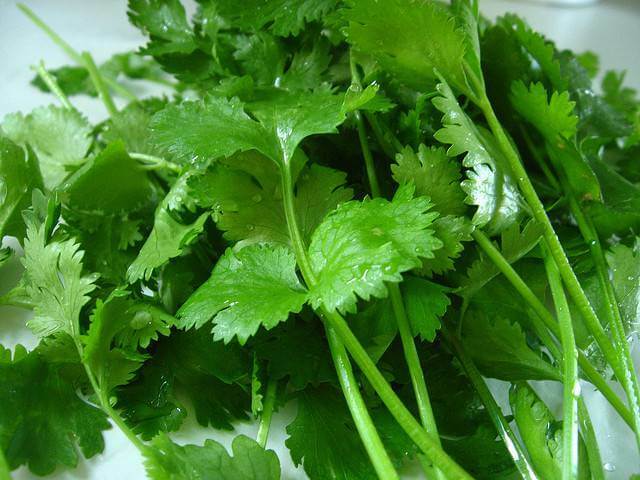 Cilantro is widely used in Mexican foods and in all kinds of sauces. Fortunately, it can be grown indoors easily by starting seeds or by buying an already established plant. It does not transplant well from outside. This is one herb that does not need to be kept moist. Water only when the top of the soil is dry to the touch. In my opinion, thyme is as pretty as it is tasty. The tiny, low-growing aromatic leaves are perfect for looking at and cooking with. Common thyme can be added to meat, salads, sauces, and side dishes. Lemon, lime, and Pennsylvania Dutch Tea thyme are all wonderful additions to teas. There are more than 300 varieties, so I am sure you will find a thyme that suits your fancy. 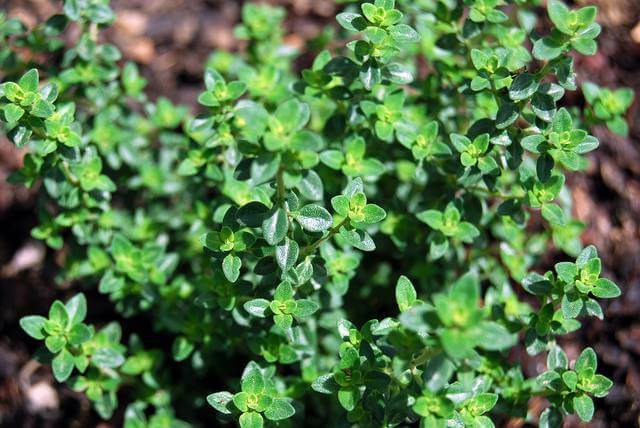 Thyme can be started from a clump or cuttings, but starting from seed can be a slow and difficult process. Thyme, like cilantro, should not be kept moist but should be allowed to dry out before watering again. I think most everyone knows what chives are. The mild, onion-flavored herb is used to add flavor to baked potatoes, soups, meats, salads, dips, and more. Even the pretty ball-shaped lavender flowers can be eaten and look quite beautiful in a salad. 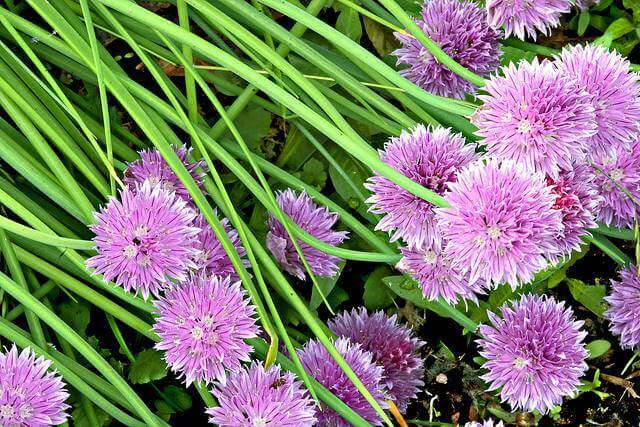 I prefer to buy a pot of chives for use indoors, but you can dig up a clump from the garden if you gradually accustom them to shadier conditions before bringing them indoors. The trick is to keep the soil evenly moist or the leaves will yellow. The other trick is to keep cutting back the leaves to prevent flowers (unless you want the flowers); they will die back after flowering.